The original State Opera House, a neo-romantic building severely criticised when it was built, was inaugurated on May 25, 1869 with Mozart's Don Giovanni. During World War II, the stage was destroyed by Allied bombs and the building gutted by fire on March 12, 1945. The foyer, with frescoes by Moritz von Schwind, the main stairways, the vestibule and the tea room were spared. Almost the entire décor and props for more than 120 operas with around 150,000 costumes were destroyed. 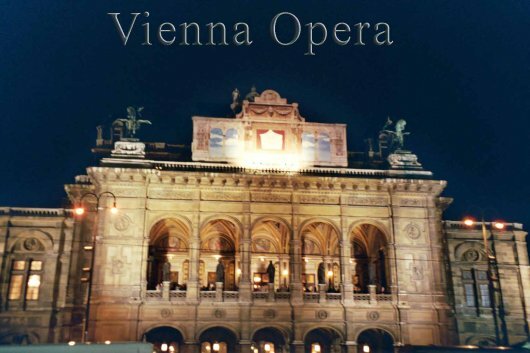 The State Opera was temporarily housed at the Theater an der Wien and at the Volksoper.The rebuilt theatre, seating more than 2200, reopened on November 5, 1955 with Beethoven's Fidelio with Karl Böhm conducting.For many decades, the opera house has been the venue of the Vienna Opera Ball.